Venerable Thecla Merlo, co-foundress of the Daughters of Saint Paul, as early as 1931, had resolved to seek only the glory of God and peace of all people. On the feast of the Blessed Trinity in 1961, she made an offering of her life for the entire Congregation of the Daughters of Saint Paul so that everyone may become saints. On Christmas day of this same year, she made her gift known to her sisters when she said: “I write these things to you not only with the pen, but also with my heart. 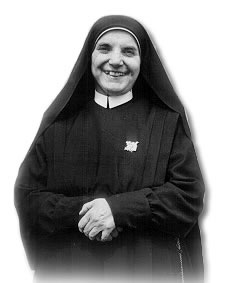 I wish you all to be saints: for this I have offered my life—for everyone, that we may achieve the holiness God wants of us.” She died on February 5, 1964, leaving her daughters this rich spiritual heritage and the sure road in the Church. We wish to highlight a few of her writings which could help every person live well his/her life in sanctity especially during this Year of Faith that we are celebrating. the wise mother and sure guide of the Daughters of St. Paul. with the instruments of social communication to the point of total sacrifice. the favor we ask of you.